Price includes 1 deer and/or 1 hog (meat pig, boar, or trophy boar). Additional hogs may be taken at $175 each.Please check deer hunting season dates below before booking. Traditional Florida wild deer hunting in the expansive wilderness of South and Central Florida. **Florida deer hunting season is divided into four zones. Our ranch is located in ZONE A. Click here to view the latest season dates. Or call (888)486-8356. Deer and hogs are hunted by tree stand, stalking, guns, spears or with the aid of dogs. This is a great hunt for the whole family. We use several different tactics for hunting Florida wild deer depending on the weather, hunter’s abilities, food sources, and rutting activity. Florida wild deer have large home ranges with limited forest cover and concentrated food sources, but they also have some predictable traits. Florida deer generally favor edges created by two different cover types, such as where a hardwood ridge grades to a softwood swamp. They use stream bottoms, saddles, and long, sloping shelves as natural travel guides. At Alligator Alley Outfitters we find that the most successful method for hunting is from tree stands or blinds, overlooking these key areas. We acknowledge our wild deer hunting success to several key components. Hunter concealment in our stand locations plays a major part, along with our time proven methods of scouting, baiting, and the natural setting of the bait site. To have steady success in deer hunting involves a group effort and plans well in advance of the season. Baiting starts a month prior to the season’s opening day. We work around the clock setting up the best locations and baiting sites. The massive area we have to hunt allows us to maximize the number of hunting stands with no overcrowding of any area. 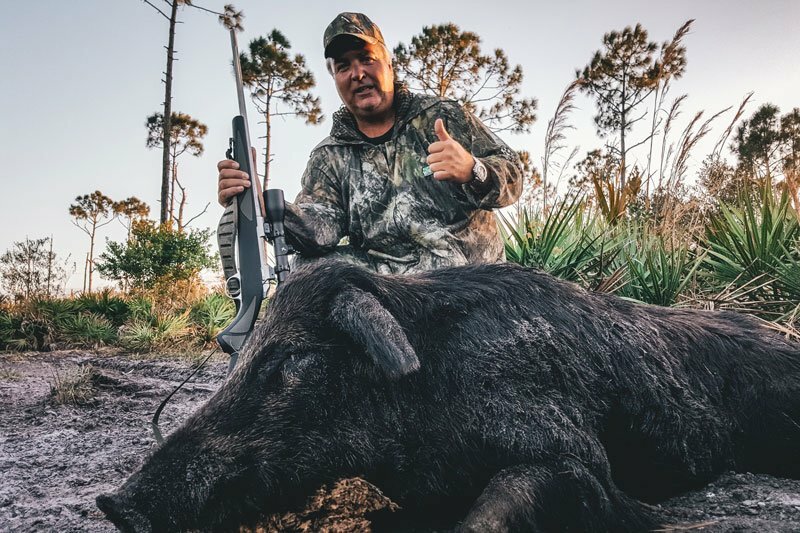 Our team-oriented philosophy combined with the unique and highly populated deer hunting area truly creates one of the best hunting opportunities in Florida. The double whammy! Price includes 1 deer and/or 1 hog (meat pig, boar, or trophy boar). Additional hogs may be taken at $175 each. Please check deer hunting season dates below before booking.